Based on original interviews with DJs, b-boys, rappers, graffiti writers, activists, and gang members, with unforgettable portraits of many of hip-hop's forebears, founders, and mavericks, including DJ Kool Herc, Afrika Bambaataa, Chuck D, and Ice Cube, Can't Stop Won't Stop chronicles the events, the ideas, the music, and the art that marked the hip-hop generation's rise from the ashes of the 60's into the new millennium. Jeff Chang has been a hip-hop journalist for more than a decade and has written for The San Francisco Chronicle, The Village Voice, Vibe, The Nation, URB, Rap Pages, Spin, and Mother Jones. He was a founding editor of Colorlines Magazine, senior editor at Russell Simmons’s 360hiphop.com, and cofounder of the influential hip-hip label SoleSides, now Quannum Projects. He lives in California. D.J. 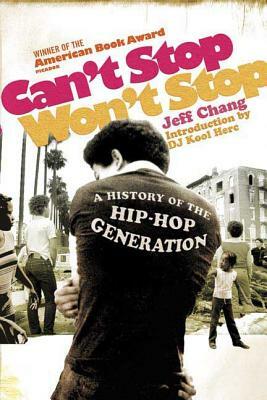 Kool Herc contributed to Can't Stop Won't Stop from Picador.